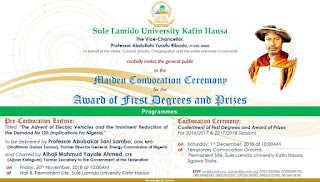 Sule Lamido University, Kafin Hausa [SLU] First [1st] / Maiden Convocation Ceremony Programme of Events of Undergraduates and Postgraduate Students for the Award of First Degrees and Prizes - 2016/2017 and 2017/2018. Lecture Tittle: The Advent of Electric Vehicles and the Imminent Reduction of Demand for Oil: Implications for Nigeria. Conferment of First Degrees and Award of Prizes for 2016/2017 and 2017/2018 Sessions. Date: Saturday, 1st December, 2018. 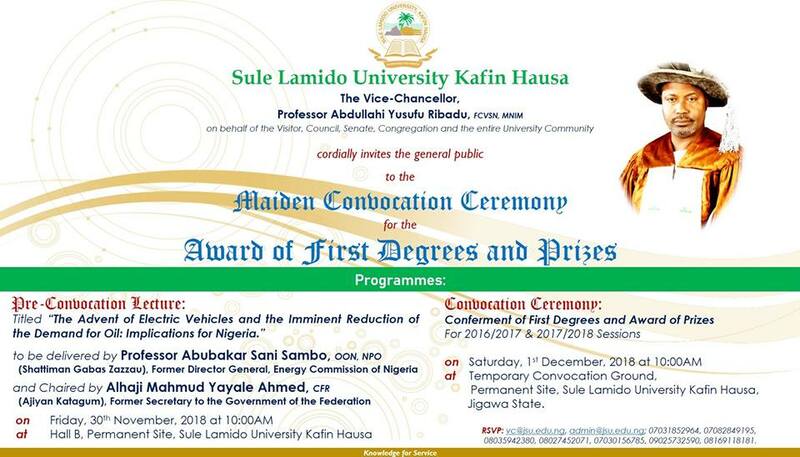 Venue: Temporary Convocation Ground, Permanent Site, Sule Lamido University, Kafin Hausa Jigawa State.